Why Building Projects on Ethereum are Destined to Fail. Many people have asked me why we chose to build our Token project on the Stellar protocol, and my answer is quite simple. If we had built our project on the ERC-20 standard (Ethereum), it would have failed. In fact, I believe that almost all projects backed onto the Ethereum chain will fail, here is why. It was June of 2017 and I was discussing using the Blockchain or DLT (Distributed Ledger Technology), with my cofounder Will, to solve a massive problem that loyalty had in the retail brand space. It was a no-brainer really as we could extend our existing online-to-offline (O2O) platform to capture loyalty as well and using the distributed ledger ticked a lot of boxes. The next task was for us to evaluate what chains existed that we could leverage to build out or solution on. The obvious choice was Ethereum as it was widely being used by many projects and there was a lot of hype around it at the time as they had an ERC-20 standard that supported smart contracts. We ended up deciding on the Stellar protocol and we are so happy we did, below is a summary of that journey and how we got to where we are today. Now if you are going to build a project that is truly decentralized with no central decision making, Ethereum is a great choice. But most blockchain companies don’t need smart contracts to execute their core business logic or want to circumvent the legal or jurisdictional problem. They just want to issue digital assets and process transactions. That’s exactly where Ethereum will let you down. If you are building a project where tokens will be issued where they need to be traded quickly and at low cost then Ethereum will fail every time. Our project involved issuing tokens that needed to be used in a retail environment while transactions were happening in near real-time, this was a concern. With all tech projects you start from the user experience and work back from there, and using the Ethereum chain we would have been in big trouble from day one. To confirm this we observed tests that were carried out between April and May this year 2018. The results and methodology can be found here on GitHub. Problem 1: Your most enthusiastic users will have the worst experience. 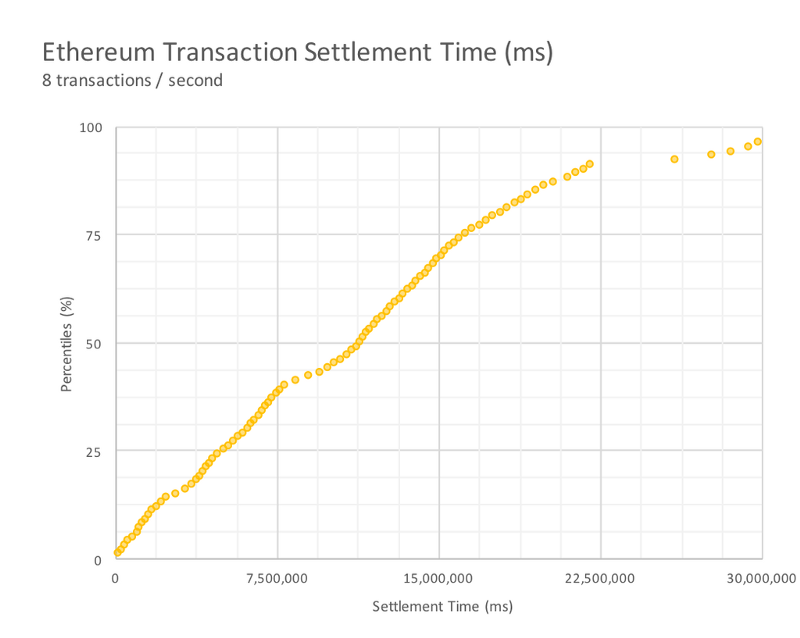 Ethereum queues transactions on a per-account basis, and yet miners don’t prioritize transactions by wait time. In fact, given transactions with equal gas prices, miners are assigned them at random. 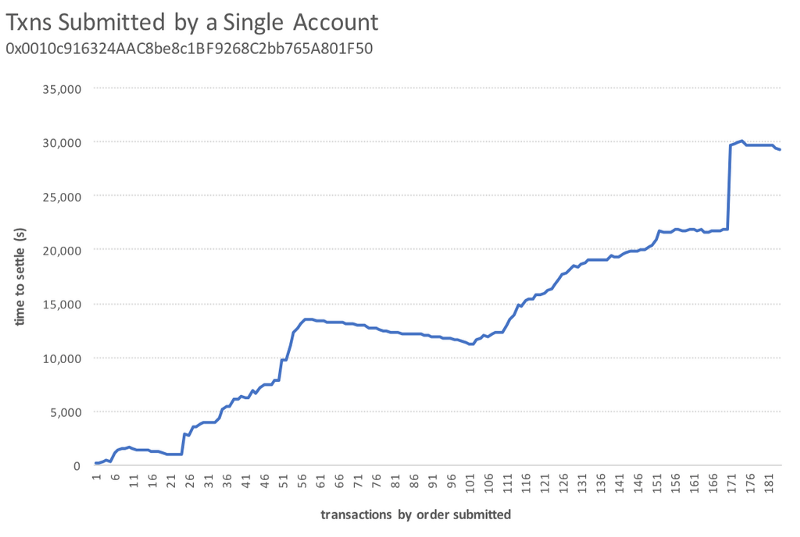 So an active account builds up a transaction queue, and the network has no mechanism to clear it. The result, for high-volume accounts, is an ever-increasing transaction lag. This is actually very similar to the “please take a number” systems you see at a deli or at a government office like the DMV, and it’s a fairly common way to prevent replay attacks. Lots of other chains do something similar. However, Ethereum’s transaction-to-block algorithm (or, really, lack thereof) adds the wrinkle that the people working your DMV window here — the miners — aren’t necessarily accountable to the next number in line. 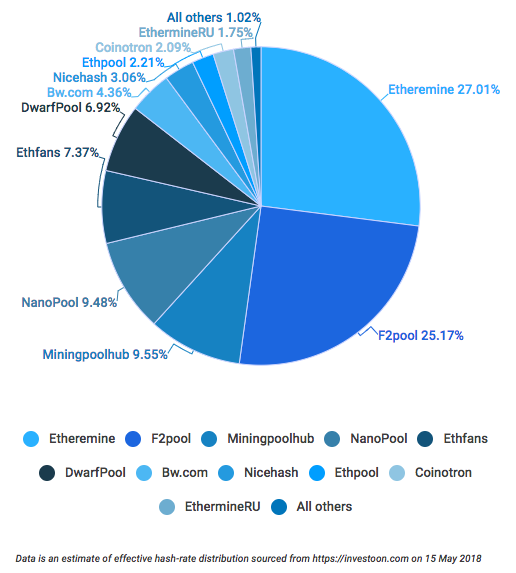 As you can see in the graph below, Ethereum mining is dominated by a few select mining pools — the four largest miners account for a whopping 70% of the Ethereum hash rate. Miners often have their own criteria for the transactions they’ll accept. Many only accept high-gas-price transactions. Some only accept their own transactions. Miners like these will let block space go unused before filling it with something from your queue. So now imagine a DMV where certain windows are telling people “sorry can’t help you,” while more people file into the waiting room every second and you have all these jokers in front of you who have to get helped before you can even talk to someone — and, voila, you have some idea of how Ethereum handles transactions. We weren’t aware it worked like this until after we tried to implement Kik’s load spec: 480 accounts each submitting 1 txn/minute on average for 3 hours. That’s 86,400 total transactions, an average of 8 per second. We spun up the test, using ETH Gas Station’s “standard” estimates for gas, expecting a median confirmation time of about 30 seconds, and, lo and behold, 13 hours later, more than half of our transactions still hadn’t made it into a block. We stopped the test at 13h and 50m, and 50.1% of our transactions were missing. (Reminder: the raw data is in our GitHub, if you want to check our work.) We thought we’d messed up somehow, but, no. We had just created a bunch of long lines, and some jabroni transactions had stood there all day doing nothing. When you read elsewhere about “Ethereum transaction times”, the posted numbers almost always suppose a single, one-off event. They do not pertain in an application-level environment. We ran the Kik test again just to really make sure we were doing everything right, spending another 6.9 ETH, and we got essentially the same result. Here’s a typical experience from that run — this is just the account that happened to be first alpha-numerically. You can see the wait times grow as transactions pile up. It’s one thing to talk about “settlement time” in the abstract. But think about the above data in terms of actual user experience. The more someone uses your Ethereum app, the slower it goes. After just three hours, their transactions are taking 8 hours to confirm. 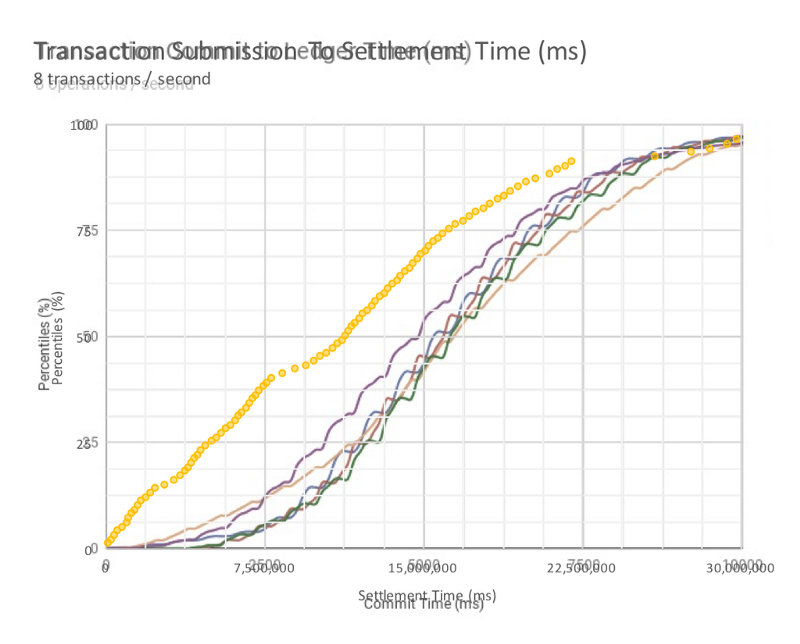 Of course Kik’s test spec said we should submit transactions for three hours and then stop, so that’s what we did. In the real world, you can’t build in downtime to allow the count to catch up — so in theory transaction queues just get worse and worse. In practice, of course, as your Ethereum app becomes unresponsive, users will help it catch up, by leaving. Here’s the performance distribution from that second test. I trimmed the slowest 5% so the long-tail doesn’t skew the overall picture. Everything looks comparable until you notice the x-axes. The waits we measured on Ethereum are 3,000 times longer. That’s the queuing problem in a nutshell. This performance issue is currently a fundamental part of Ethereum. Improvements like sharding or Casper are promising in theory, but those will be complex fixes layered over Ethereum’s almost maximal complexity. Something like lightning can rely on Bitcoin’s inherent simplicity; whereas there’s nothing basic to fall back on here. A skyscraper is usually built on bedrock, not on top of another skyscraper, yet that is what a lot of Ethereum scaling solutions propose to do. The only certain performance improvement is to spend more on gas and hope to plow through each account queue faster. We in fact did that in a third three-hour trial — which we ran because of our “we should do what we can to make this work” commitment. The previous two tests had used the “standard” ETH Gas Station recommendation. 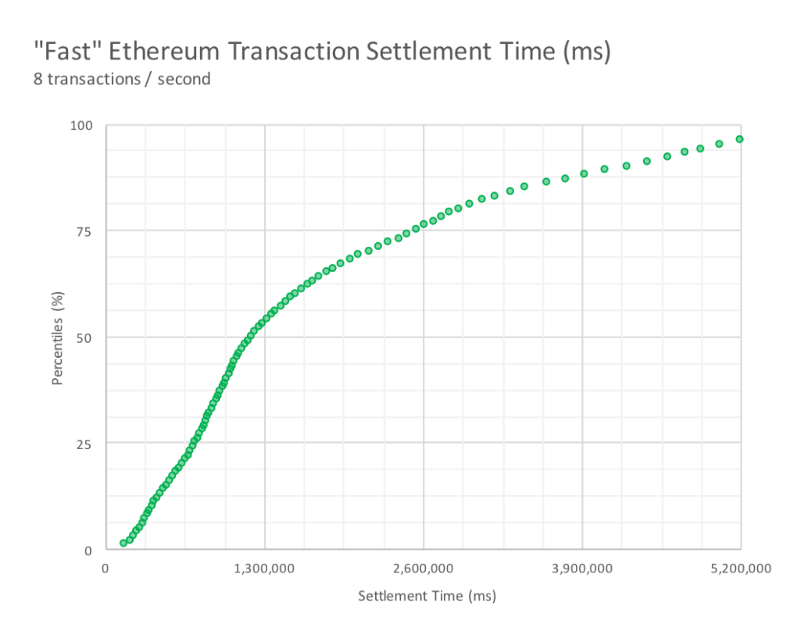 We used the “fast” tier (≈4 Gwei at the time) for the third and spent 11.8 ETH on our 480 accounts. Performance improves — to only 500 times slower than Kik’s results on Stellar — but it’s still not fast enough. The backlog builds and payments hang around with nothing to do. Ever thus to power users. But Ethereum is also unsuitable for the other kind of adoption, what you might see with an app like, I dunno, Etsy, where instead of a few people going deep, you have lots of people checking in every once in a while. That’s because an Ethereum app’s per-user costs go up quickly as it adds users, and that’s why you see stuff like 70x price spikes whenever anyone tries using the network across many accounts. We captured this data incidentally, looking for a workaround to the queueing problem. 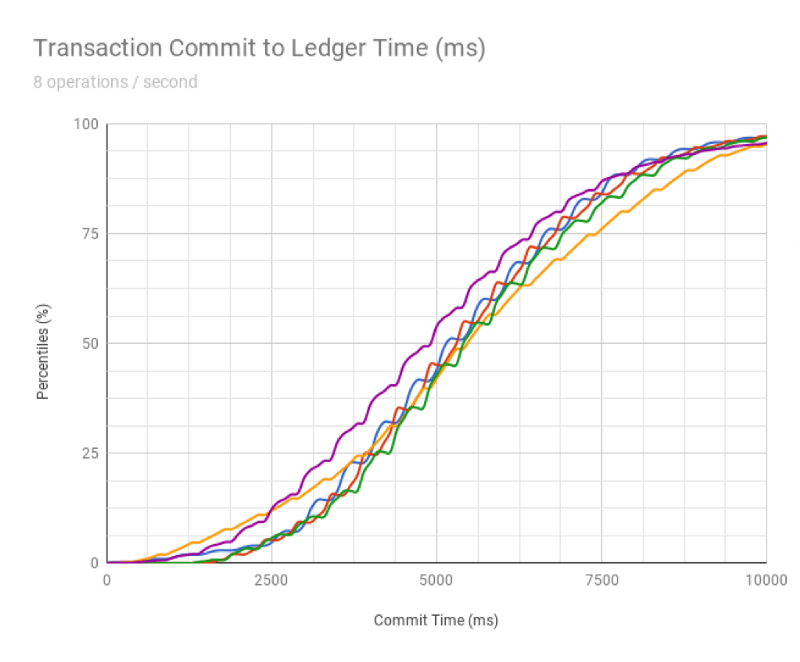 To keep transactions from piling up, we refactored the Kik spec as follows: instead of a few accounts submitting a bunch of transactions, we spun up a bunch of accounts (28,800) and had each of them just do a single transaction. 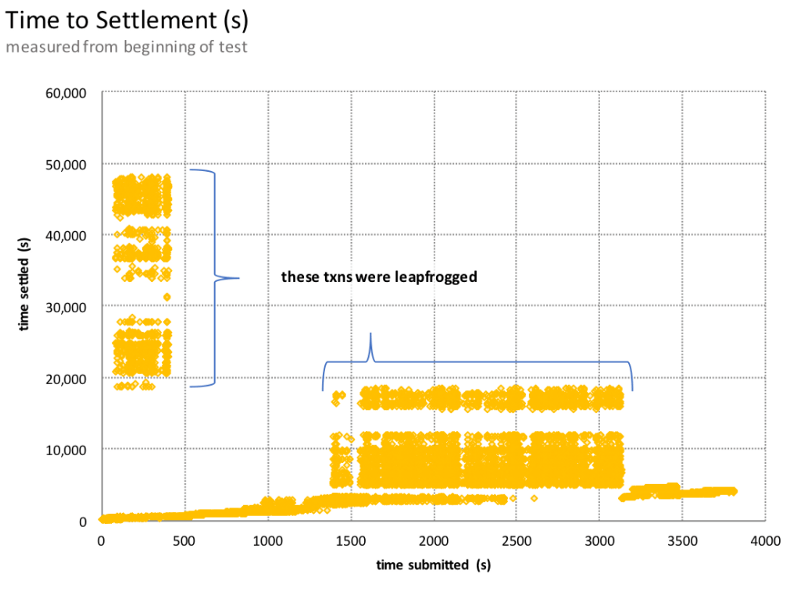 To stick to the original test’s guideline of 8 total txn/s we submitted the transactions over the course of an hour. We knew account queues couldn’t be the issue. It turned out that as soon as our transactions started hitting the network, miners’ fees soared. So our earliest transactions, submitted with pre-test “standard” pricing, were quickly priced-out. They lingered in low priority for hours. We had discovered another of Ethereum’s negative reinforcement loops. Adding users immediately scales cost. In the real world, increasing the number of units implies lower per-unit costs. Basically the whole private sector is built on this idea — “economy of scale”. But here: each incremental user immediately increases the per-user cost. It’s like bizarro economics. You can see prices climbing ≈6x over the short 1-hour run of our test. Again, the built-in time limit of the test makes everything look more sustainable than it actually is. Extrapolate this chart out and drop the needle somewhere in the middle. What do your per-user costs look like after two weeks of steady usage? Two years? The above test cost us $1,445 for a single hour. It ran when gas prices were low, just ≈1 Gwei for standard speed, and it puttered along at just 8 transactions a second. To run a basic test, that’s $12.6m a year. If you apply that cost structure to a real business, you see that Ethereum’s fees are already unsustainably high. 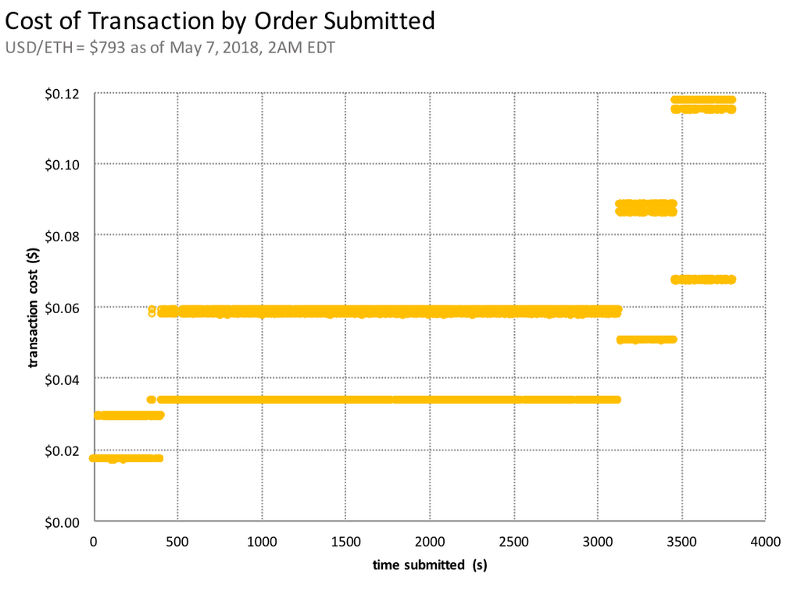 For example, PayPal does about 240transactions a second. Put aside the performance fixes it would take to make that happen and put aside the rising-price dynamic I just documented. If PayPal had been built on Ethereum and paid our observed rate, they would’ve laid out $380m in network fees last year. That would’ve been 21% of their net income, and, again, that’s pretending that you could somehow freeze prices. An idealized version of Ethereum won’t work for one of the most profitable transactional businesses in the world. How is the real version going to work for the rest of us? I encourage you to watch the full panel this quote came from — it shows four of the most important members of the Ethereum team saying a lot of what I’ve been saying here. When today’s high-profile ICO becomes tomorrow’s cautionary tale, it will only be bad for everyone in the ecosystem, and they know it. There’s no doubt that the Ethereum community is the strongest in blockchain, and there very likely wouldn’t be token economies at all without Vitalik’s vision. It’s not Ethereum’s fault that developers are asking from the tech what it was never meant to deliver. It’s the people chasing last year’s ICO dollars, regardless of what’s actually the right tool. Ethereum’s problems all start with misguided entrepreneurs. Don’t become another one of them. If you’re building a transactional app, the protocol will not support the behavior your users will expect. I have immense respect for the ambition and the complexity of Ethereum, but I’ve come to see it as blockchain haute couture. Beautiful, intricate, high-concept, high-minded. And not what you wanna wear to work. If you want trustless, distributed computation — if that’s really what you’re building — definitely use it. If you never plan to actually launch anything, Ethereum’s great for that, too — just ask the over 50% of ICO projects who disappear after their token sales, if you can find them. They’ve already hit the Great Filter. And likely some beach in Puerto Rico. But if you want to build a business that sticks around like we are — if you plan a typical user-to-user service and don’t need to tie up your business logic in a smart contract — if you plan to issue a digital asset and you plan to transact at high volumes as a core part of your strategy, pick a platform that is optimized for that. Do what we did, and build on Stellar. Credits: Contribution by Christian at StellarX and Tomer Weller designed and ran the load tests and provided technical guidance for this post.